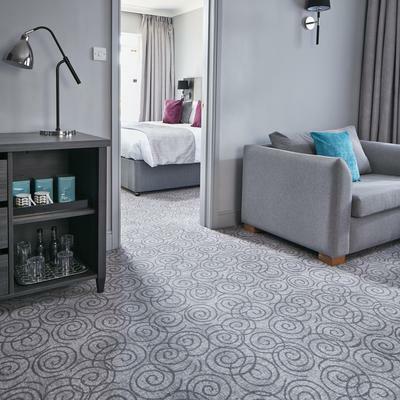 Brintons worked with Hawkstone Park Hotel on a quick turnaround revamp of the hotel using unique designs from the QuickWeave™ Inception collection. 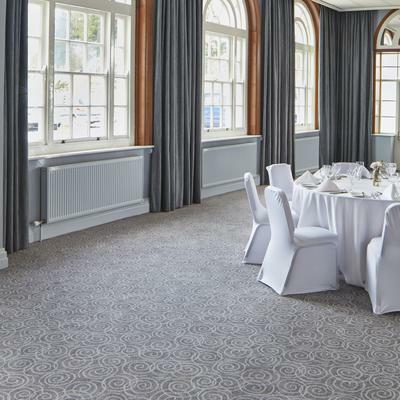 Nestled in the heart of the stunning Shropshire countryside, in 400 acres of beautiful scenery and English Heritage Grade I listed landscape, Hawkstone Park underwent a sympathetic refurbishment featuring Brintons carpets from the QuickWeave™ Inception collection. 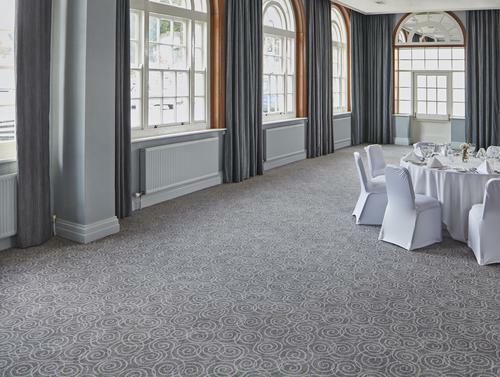 Brintons carpeted the reception, function room, corridors, guestrooms and dining area with a brief to create an on-trend modern design, but with hard wearing carpet for heavy use spaces. The chosen design is from the QuickWeave™ Inception collection with bespoke colour ways used in the circular pattern. 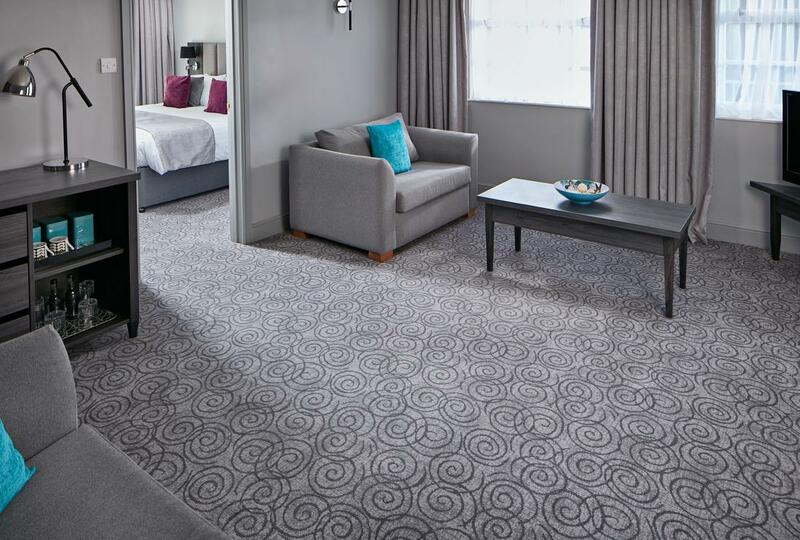 The modern and contemporary carpet runs throughout the hotel, linking the areas together to create flow in the space. Brintons have truly transformed the interiors of our hotel. We are so impressed with the quick turnaround of this project, the high-quality carpets, and the overall expertise Brintons brought to this renovation. Brintons contemporary circular carpet designs that are now seen throughout the hotel have really enhanced the hotel’s existing interiors. 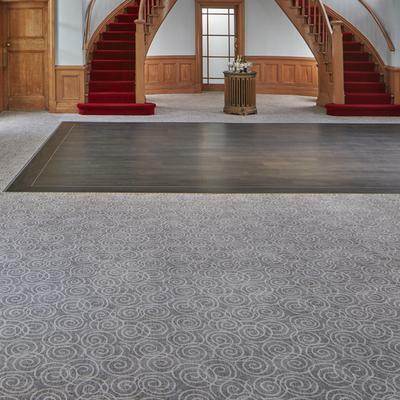 The QuickWeave™ collection was chosen to meet the demand for design-led woven carpet that can be made to order and installed in below average lead times. A critical part of the brief was to design and deliver the carpet in a short time frame. 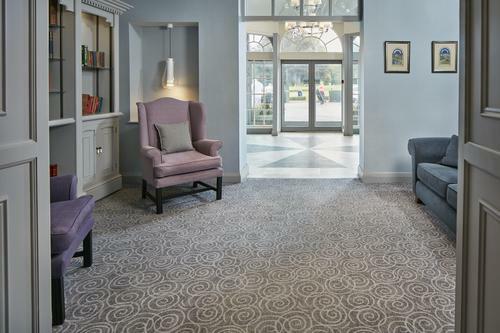 QuickWeave™ broadloom woven axminster carpet is made using the ‘Brintons blend’ of 80% wool / 20% nylon and is available in five quality specifications from 7 to 11 rows, making it suitable for all types of area from light to heavy use. 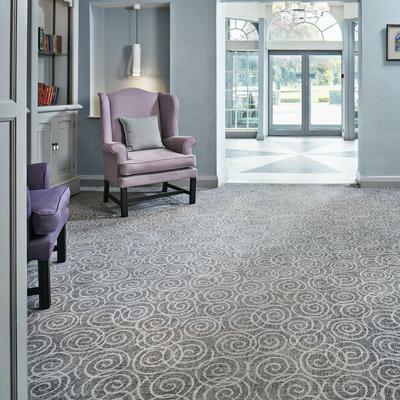 Regardless of specification, the wool element in Brintons’ famous blend results in a luxurious soft feel while the nylon component ensures the carpet will be hardwearing for longevity. The chosen design for this project is part of the Movement range from the QuickWeave™ Inception collection. The Inception collection is crafted with all the quality, expertise and passion Brintons have accumulated over the years. Each design is available in five colour ways and five different specifications so there is something to meet the needs of every customer. The Brintons design team has created a variety of styles to reflect today’s trends; as the contemporary patterns complement transitional styles such as plaids, stripes, geometric, abstract and layered design themes.